Bring six quarts of unsalted water to boil. In a large pan on high heat, add oil. Add garlic, and red pepper flakes until the garlic is slightly toasted. Add the white wine, lemon wedges and season generously with salt and fresh pepper. Rinse fresh clams in cold water then add to large pan. Cover and allow heat and oil to steam them open approx 5 – 7 minutes. Add chopped parsley and remove from heat. Cook linguine pasta according to package until al dente. Drain linguine in a colander reserving a cup of the hot pasta water. 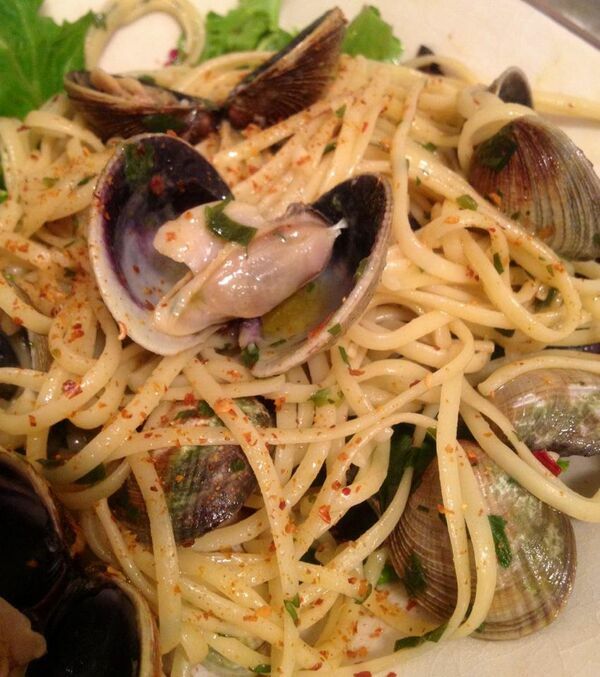 Add linguine to pan with clams and a touch of the hot pasta water then toss over high heat for a minute. Drizzle with olive oil then divide among four pasta bowls. Garnish with chopped parsley. Serve immediately. Serves 4.